The Voss collection has an ageless, fashion-forward presence. Featuring crisp edges and uncomplicated style, each silhouette brings a confident transitional style to the bath. This oil rubbed bronze two-handle high-arc bathroom faucet was built to last by MOEN. Voss 4-Inch Centerset 2-Handle High-Arc Bathroom Faucet In Oil Rubbed Bronze The Voss collection has an ageless, fashion-forward presence. Featuring crisp edges and uncomplicated style, each silhouette brings a confident transitional style to the bath. This oil rubbed bronze two-handle high-arc bathroom faucet was built to last by MOEN. 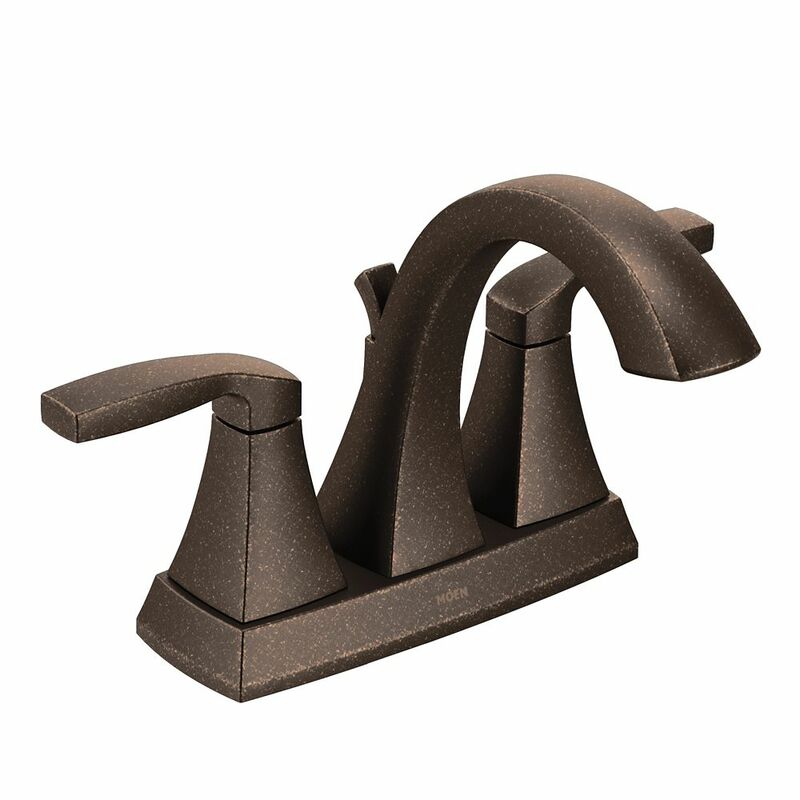 Voss 4-Inch Centerset 2-Handle High-Arc Bathroom Faucet In Oil Rubbed Bronze is rated 4.6 out of 5 by 7. Rated 5 out of 5 by DIYDude from Good design / functionality. The faucet installs easily and looks nice. Good design / functionality. The faucet installs easily and looks nice. Rated 5 out of 5 by Robert from Excellent well made faucet. Goes well with my other accessories. Excellent well made faucet. Goes well with my other accessories. Rated 5 out of 5 by ReemsCreek from Beautiful, Classic Arts & Crafts Styling Looks great with our Craftsman Style Vanity. Gorgeous color and tapered styling. Rated 2 out of 5 by Tooley from Great faucet....faulty lock down rings Bought a pair of these faucets about a 6 months ago and they look great, function perfectly, and otherwise this was an excellent purchase. However, one month ago one of the fauscets became loose so I put it on my list to get under the sink and tighten the lock down ring that holds the faucet in place from the underside of the sink. The next day both rings had broken into about 5 pieces each and the plastic ring was crumbling. I'm guessing low quality plastic from an non US source. Just this week, the same thing happened to the other faucet in a different location....both rings just disintegrated. So now I know its not from over tightening etc. The plastic just rotted. Now I'm thinking, what is going to happen to any plastic parts inside this faucet? What other Home Depot faucets have been outfitted with this same bad batch plastic from the same supplier. Maybe I will just shop somewhere else to be safe since this was a $500 investment that might just crumble away any day. I just replaced the rings with ones from Ace hardware and so far so good. But I'm still worried about the internal plastic components. I'm pretty handy....but if this was my mother's new faucet she would be looking at a plumbers bill over over $100 twice for a visit to repair both faucets at different times. So I gave this a poor rating for the poor quality control and major inconvenience needing to fix newly installed faucets. Rated 5 out of 5 by chuckster from Looks Great! This faucet is an excellent value. It was easy to install and looks great. Rated 5 out of 5 by MikeB45 from Moen to me is excellent quality and made for easy installation. The moen faucet was easy to install and is made of good quality. My faucets that I replaced were Moen. Still worked good just changing style and color.